I used to subscribe to Simple Scrapbooks magazine years ago. I admit, I was really sad to see it go. In between tournament games a couple weeks ago, I was excited to see that Creating Keepsakes magazine had released an idea book called Simple Scrapbooks. I quickly flipped through the magazine and realized that I loved many of the layouts and could use it as inspiration to jump start my scrapbooking. And that is just what I did on Memorial Day! "From: Wendy" was inspired by Lydia Jackson's layout on page 76. 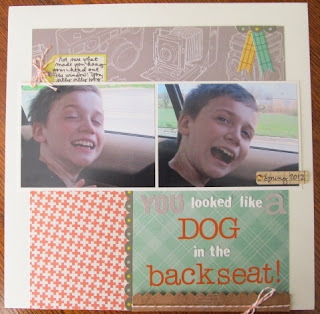 I used my March '12 "Story Hour" kit from Studio Calico to make this page. That kit had some of the best embellishments! It was really fun to use. As we pulled into the subdivision one night, Kevin rolled his window down and started goofing off by acting like he was a dog. Not sure why? Of course, since I wasn't driving I snapped pics of it and had to scrap them. I used the same "Story Hour" kit for this layout that was inspired by Wendy Sue Anderson's layout on page 18. I pulled out Studio Calico's older "Elementary" line to scrap my photos of Kevin's academic team event. This layout isn't inspired by any one particular page in the book, but many. I liked the photo placement on a 2-pager and used it as a jumping off point for my single page layout. After seeing so many things I liked throughout the book, I think I was able to pull bits and pieces from many layouts while they were fresh in my mind. My Easter layout is a lift of Kim Watson's layout on page 25. I just made a few adjustments since I used 3 larger photos than the four she used. I also added a banner. 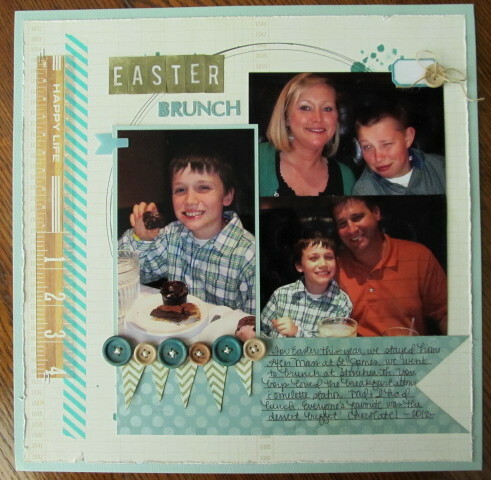 I wish I had used Prima ink instead of mist on my "Easter" alpha stickers. I think it would have matched better and left a cleaner finish. I used Studio Calico's "35mm" kit. I loved the simplicity of Jamie Harper's layout on page 10. I had some pics from last fall when my nephew was born that I loved, but the colors in the photos were a crazy mix. I selected soft simple patterns for my page using my SC "35mm" kit, but felt that it was missing something. Finally, I decided to add a berry colored sticker to back my title since it matched the top center photo. To repeat the color again, I used it to color the sticker letters for "visit." And that was my Memorial Day!